This week we have a look at an established promotion making ground into a new city, another returning to a regular venue with new faces and a third which delivers its usual great standard of matches and entertainment. Let's get Ready For The Weekend! Kicking off the weekend on Friday night and Kamikaze Pro will be making their debut in Coventry at The Empire with Underground. They have certainly made sure that their debut will be a memorable one with a packed eight match event on offering. One of the three championships being defended on March 4th will be the Relentless Division Championship. The current champion, 'All Day Star' Ryan Smile has just begun his second reign as champion after defeating Pete Dunne in a six-man tag team match alongside his Bigger Picture cohorts. His opponent shall be making his Kamikaze Pro debut and is quite simply one of best high-flyers in the world right now...'The Aerial Assassin' Will Ospreay. These two men have crossed paths before in various promotions in Englad. This time they meet with gold on the line, Smile having back up in The Bigger Picture and Will Ospreay reaching heights like he has never before. This match could very well steal the show. The main event scheduled for this Friday will see Smile's Bigger Picture ally, Robbie X defend the Kamikaze Pro Championship against AAA star Angelico. Both Robbie and Angelico have a reputation for their risk taking style. While Robbie has defeated numerous stars of the UK and further afield, he may have never have faced someone with such a dangerous mindset as Angelico. When a man is willing to jump from a balcony into a ring with no thought for their own well-being, how far will that man go to win a championship? We find out this Friday. The third championship on the line at The Empire will see the year-long reign of The Hunter Brothers under threat. They will be defending the Kamikaze Pro Tag Team Championship in a triple threat match. One half of their opponents are Mika and Elliot Jordan. After an unsuccessful challenge at Bad Apple, the duo attacked the champions and are determined to make a name for themselves. The other challengers are local team, Born 2 Fly. Kieran Young and TJ Sky will no doubt have a large group of support in Coventry on their debut. Can that support and their talent be enough to make an immediate impact in Kamikaze Pro? This match may be the most challenging that The Hunter Brothers have faced as champions. But there is a reason they've been champions for over a year. 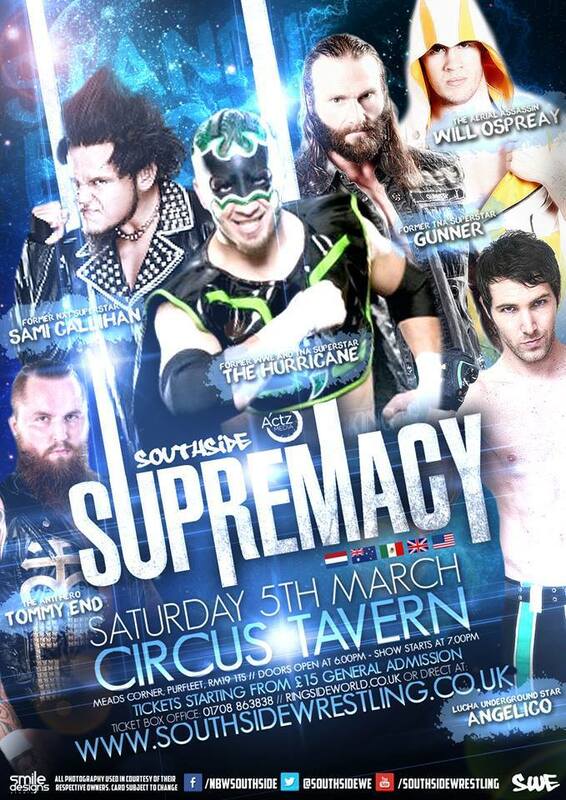 Moving on to Saturday and Southside Wrestling are back at the Circus Tavern in Purfleet, Essex. The first match that they announced for the event was made was back in early December when they confirmed former wXw World Tag Team Champion and recent WWE star Sami Callihan would be returning. However, his return won't be an easy one with his opponent being 'The Star Attraction' Mark Haskins. A former Southside Heavyweight Champion, Haskins possesses all the tools and and talent to show Callihan that times have changed while he was in WWE NXT and one of the biggest dogs in the Southside yard is ready to 'welcome' him back. Nixon Newell shall also be in action this Saturday as she once again defends the Queen Of Southside Championship. Nixon has defended her championship at every opportunity against multiple people at the same time. She now faces someone who is not only a very worthy opponent but someone she may call a friend in SHINE Wrestling regular Leva Bates. Nixon and Leva had great fun when they were a tag team just a few weeks ago but the smiles won't be there this time as it will be all business when the world-travelled Leva challenges the Queen Of Southside, Nixon for her championship on March 5th. While one championship will be defended, another championship is guaranteed to be around a new waist after Saturday. Originally, Jimmy Havoc was scheduled to defend the Speed King Championship against Flash Morgan Webster, Martin Kirby & Andrew Everett in a four-way match. However, after suffering a serious knee injury during a tour of Australia, Southside have had no choice other than to relieve Havoc of the Speed King Championship. Therefore, Angelico shall now enter the four-way match at the Circus Tavern and one of these four men will be walking out the new Speed King Champion this Saturday. 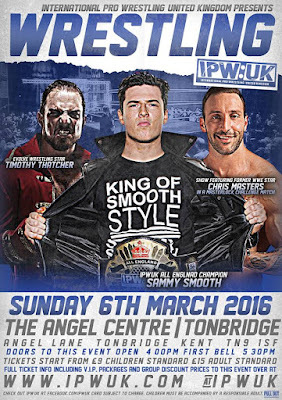 Finally ending the wrestling weekend in Tonbridge with IPW:UK and their Final Chapter event at The Angel Centre. The show will once again see Tom Dawkins look to get some revenge against The Swords of Essex and in particular, Paul Robinson. These two men met back in January but their issues were not settled after interference from the newest member of The Swords of Essex, Scott Wainwright. This time Dawkins gets his hands on Robinson in a match where anything will allowed as it will be fought under street fight rules. Dawkins may appear to be backed into a corner but he's sure to come out fighting this Sunday. 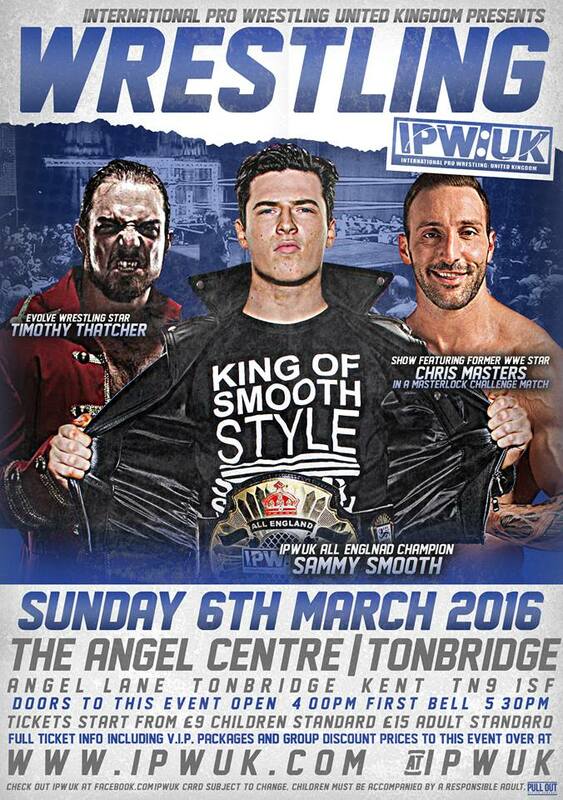 Sammy Smooth will once again be in action this Sunday as he once again defends the All-England Championship. Since winning the title and ending Jimmy Havoc's huge undefeated streak, he has encouraged the biggest and best challengers in the world to face him. March 6th shall be no different as he puts the championship on the line against Beyond Wrestling star Chris Dickinson. 'The Dirty Daddy' has been making a name for himself in recent months, including the last few weeks while he has been on a tour of the UK. Smooth has defeated world-class competitors during his current championship reign and it's time to face another. Will the 'Smooth' reign continue or shall it be time for the championship to go to it's Daddy? In recent months, IPW:UK have featured a number of traditional British rules matches. This Sunday shall see the latest as current EVOLVE Champion Timothy Thatcher shall face British Wrestling legend, Johnny Kidd. Kidd is a legend for a reason as he is still one of the most gifted technical wrestlers to have ever competed. Thatcher is a man who continues to use these traditional hold-for-hold techniques that Kidd is famous for. This match will be old old school vs new old school but with the roots very much based in tradition. Matches like these are not as common as they once were but they are no less fascinating and enthralling to witness.